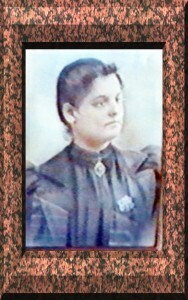 Ermenia Quilietti was the daughter of Leonardo Quilietti and Eletta Brucciani. She was born on 27th May 1874 in Castelvecchio Pascoli. Her cousin Peter Dante was to be the great love of her life, even although he had left their village in 1888 with his parents bound for Rhode Island, U.S.A. 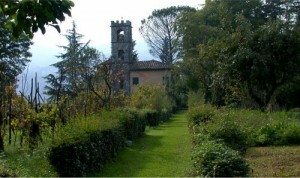 The church of Saint Nicoli' in Castelvecchio. All Quilietti's, Dante's and Brucciani's were baptised here. 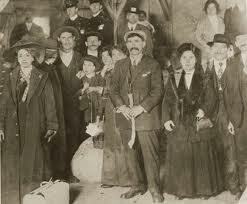 1888 was the year the Dante family left Italy for America. They were one of the first of the Italian settlers to settle in that part of the country. THE IRISH were the first Roman Catholics to come to the state in large numbers. Between 1810 and 1845, about 5,000 Irish settled in the state, working as coal diggers in Portsmouth, railroad builders in Providence and ditch diggers on the Blackstone Canal. By the mid-1850s, in Rhode Island, the secretive anti-Catholic movement known as the Know Nothings won all statewide political offices. Until 1887, The Providence Journal ran “No Irish Need Apply” employment ads. The newspaper’s editor, Henry Bowen Anthony, editorialized against the Irish immigrants, calling them “foreign vagabonds” who would never assimilate into larger American society. By 1905, 7 out of every 10 Rhode Islanders were either first- or second-generation Americans. A state census that year showed that Rhode Island had become the first state in the nation to have a Roman Catholic majority. The 1910 census calculated the number of immigrants at almost 180,000, or substantially more than the 119,000 foreign-born state residents counted by the 2000 census. 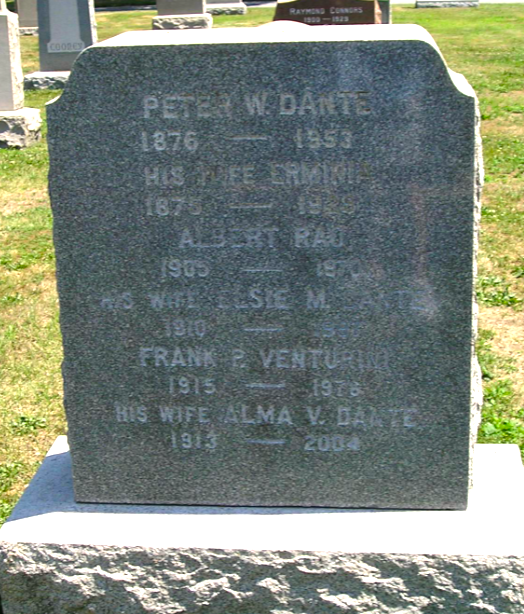 By the time of Ermenia’s marriage to her cousin Peter the Dante family were well established in the town of Providence, Rhode Island. They had a fruit business which their sons, Peter and Francesco helped run. Ermenia and Peter were married in 1901. By this time there was a change of profession as Peter started work in the textile mills which were dotted all along the Blackstone River. Life in the mills wasn’t easy; 12-hours days were the norm, amid the mind-dulling noise of a power loom. Factories were freezing in winter and sweatshops in summer. The nasty secret behind Rhode Island’s flourishing textile economy was the state’s shameful record of child labor. Small hands and tiny fingers worked in the mills, creating lives of luxury for factory owners. By the dawn of the 20th century, Rhode Island relied on child labor to a greater degree than any other state in the industrial Northeast. Children quit school to work in factories and lost limbs in machinery. It was the price of supporting immigrant families. By 1905, nearly 20,000 Italians were living on Federal Hill. They were jammed into triple-decker tenements along narrow streets in the same buildings that once housed a fledgling Irish community, whose members had earned enough money to move up and out. He started off as a gear-changer. Not long thereafter Peter travelled to Scotland where he re-united with his cousins and brothers-in-law. 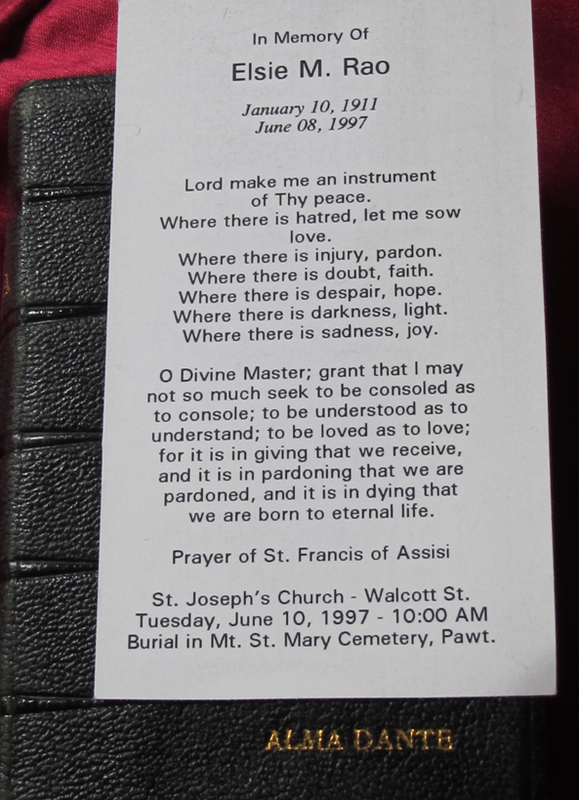 1904 saw the death of Peter’s father Christofano Dante. [Christopher]. By this time the whole family were residing at 338 Main Street. 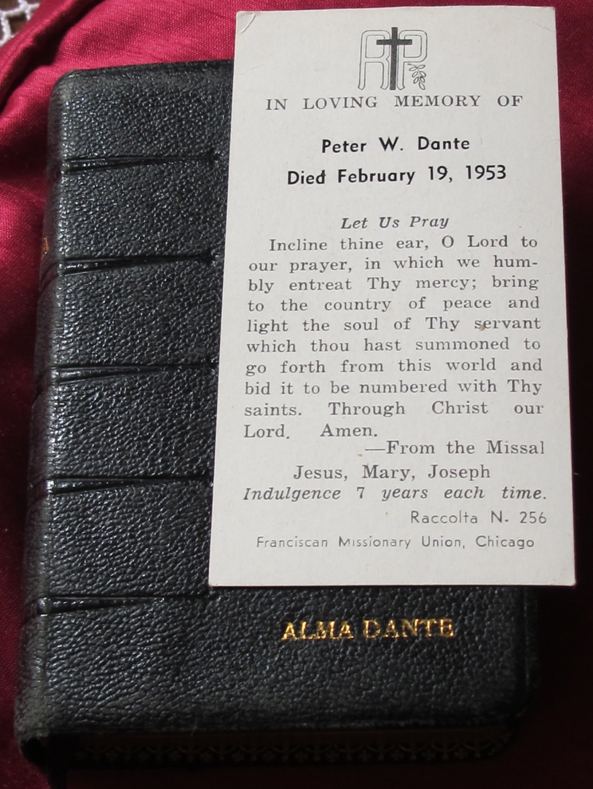 Peter’s mother Annie Brucciani Dante still had her family with her at the family home. Ermenia and Peter lived here as did Nellie Aurielo and her husband James [Peter’s sister and brother-in-law]. 1905 was the year Ermenia’s youngest sister Maria Domenica Quilietti travelled from Italy to join her. She had her baby daughter Ellen with her. Because she was unmarried the baby was ”adopted’ on her arrival in the town by Ermenia and Peter. They brought up the baby as their very own and cherished her as they had no family of their own yet. 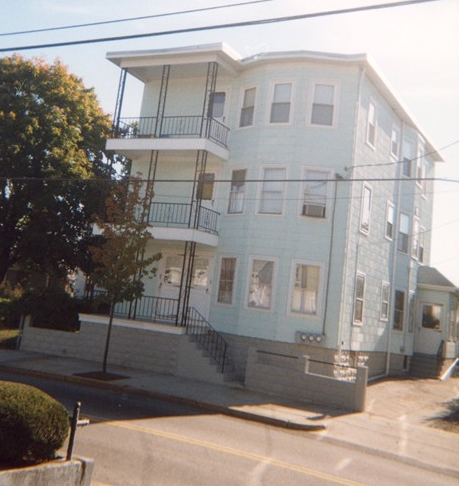 Ermenia moved out of the big house to a small apartment at the rear of 174 York Avenue in Pawtucket. The family lived here for a few years until the birth of their first natural child whom they called Valentina [named after Valentina Brattisani Quilietti who had died in 1905]. Unfortunately the poor baby died after only 2 days with complications owing to prolonged pressure on the cord. 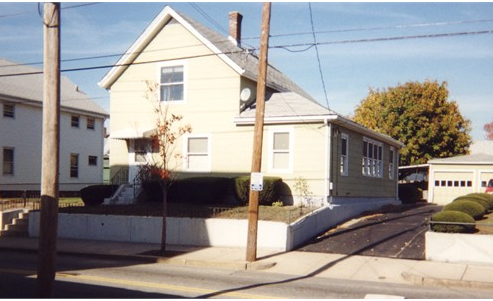 It was not until 1910 that the family moved to their new and permanent address at 82 Prairie Avenue, Pawtucket. It was this year that Elsie Dante was born. 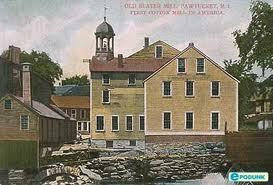 Slater Mill on the Blackstone River. In 1912 baby Leonardo Dante was born [named after his grandad]. Again tragedy hit the couple when he survived only 14 days, with bronchitis being the killer this time. The following year Elsie arrived. This address was now the permanent address of the Quilietti family in America. Giuseppe and Adolfo Quilietti arrived in 1911 and lived upstairs until they had established themselves and moved to a larger premises at No. 87 directly opposite a few years later. All this time Ermenia played the mother’s role and looked after this growing family with Ellen her adopted daughter always looking upon Ermenia and Peter as her natural parents. It was not until Ellen decided to marry herself that she was told of her true parentage, that her aunt Maria Domenica was in fact her natural mother. 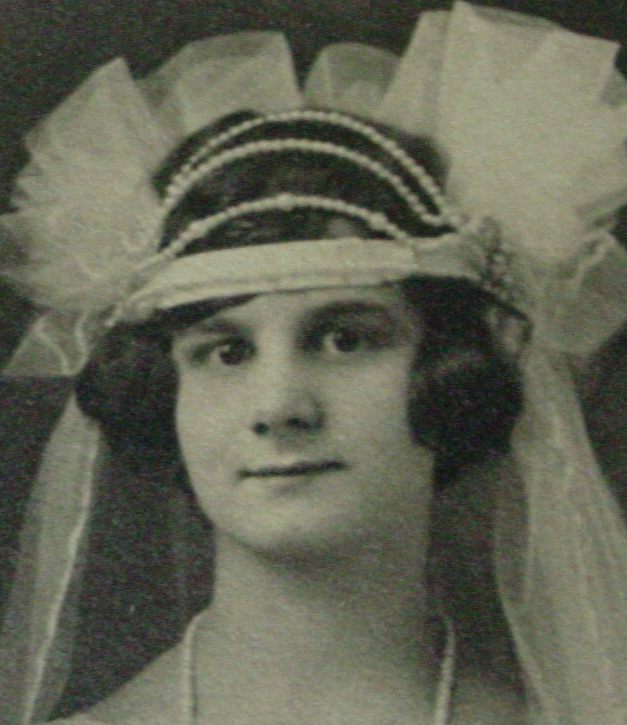 Ellen married in the year 1924 to another Tuscan Louis Peter Pelligrini. He also joined the household. They had a son born the next year in the family home. But poor Ellen died after a difficult birth of a dilated heart. The boy survived. Ermenia and Peter were heartbroken as their eldest daughter was buried in the Pelligrini Plot in the old cemetery. Louis remarried a few years later and took the boy away. The family never saw the boy again. This broke their hearts. Ermenia did not keep good health and according to her two daughters Elsie and Alma she was a strong-willed determined woman who fought off all the odds. But her many illnesses and diseases caught up with her when in the year 1929 she died. 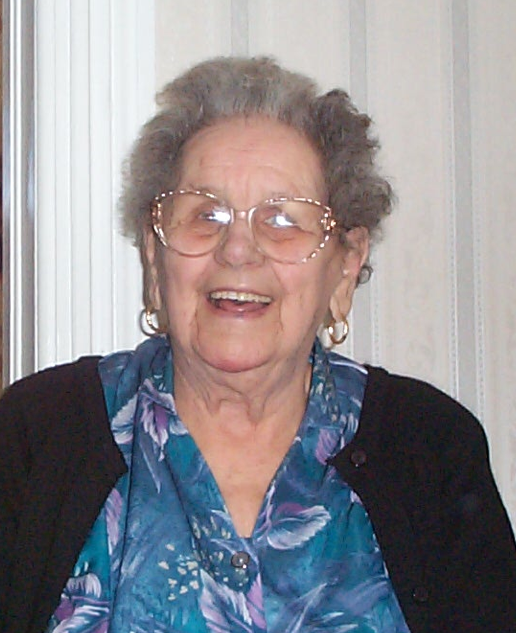 Later that year Ermenia’s aunt [and mother-in-law] Teresa Brucciani Dante also died. This was a sad year for the Quilietti clan in America. Ermenia is interred in Mt. St. Mary’s Cemetery in Pawtucket.